Claim up to €/£/$250 welcoming bonus Play Now! Microgaming waited the guts of seven years to release the Thunderstruck 2 slot as a May 2010 sequel to the original Thunderstruck, a game that reached into Norse mythology. Thor is once again the star of the show, but is now joined by a number of other mythical figures as part of the slot’s special features. 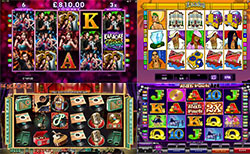 The seven-year gap between the two slots has allowed for Microgaming to craft a more ambitious sequel compared to the original. All in all, the artwork is more crisply designed and the slot performs even more smoothly on mobile and desktop devices. One design feature shared by the two slots is that Thunderstruck 2 is also made with five reels and three rows. However, the sequel makes greater use of the available space by integrating 243 ways of winning, thus adding many more opportunities compared to the nine paylines of the original. The wagering options allow for players to stake from €0.01 to €0.25 each on up to 10 coins. Therefore, Thunderstruck 2 allows a minimum stake of €0.30 and a maximum of €75.00. There are Thunderstruck 2 wilds that substitute missing symbols in paylines and also double the value of winnings. An extension of this is the Wildstorm feature that can strike by randomly turning up to five reels wild. • Valykrie: a first entrance to the hall will earn 10 free spins and a 5x multiplier. • Odin: the 10th visit to the hall earns 20 free spins and the Wild Raven feature, which randomly changes ravens into multipliers. • Thor: entering the hall for a 15th time will deliver 25 free spins with Rolling Reels. This is when consecutive wins increase a multiplier up to 5x. Thunderstruck 2 is a worthy successor to the original for a few reasons, namely the improved graphics, higher return to player (RTP), and Great Hall of Spins feature. Although showing its age a little, Thunderstruck 2 is still one of the most rewarding mobile slots to play Microgaming casinos online. Grand Mondial Casino has adopted a name that proclaims its worthiness for the world stage.